I'm not sure if I mentioned that I joined a new band at the end of August. That's one of the reasons why I haven't been posting much recently. To say that I'm out of my comfort-zone would be a serious understatement. 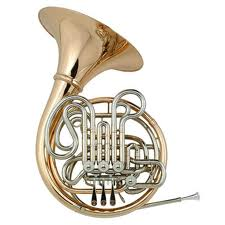 The standard is very high, there are some professional musicians, some music teachers, some people who've played for 20, 30 years, and then there's me...took up my French Horn 6 years ago, practice as much as I get time to , and LOVE it. The moment I had been dreading came tonight. The other 3 French Horns were absent. Nobody to lean on, or hide behind! So, I was all alone. And if that wasn't bad enough, tonight's conductor is a French Horn player. I just knew that every time I'd play a wrong note, he must hear it, above any other instrument in the band. Kept my nerve until the interval, and kept thinking "I'll go home at the interval if they haven't thrown me out before then". Got chatting to the player next to me during the interval, and he encouraged me to just play what I can, "you're doing great". After the interval, one of the other French Horns arrived, and the relief on my face must have been obvious to all! At the end, the conductor came over and asked me how I was getting on. I told him how nervous I felt, how exposed, how out-of-my-comfort-zone. He was lovely! Said "we've all been there, just relax and play what you can" . (note to self: you never know how valuable a few kind, reassuring words can be to someone). Isn't that the truth! So glad they were kind and encouraging to you! Well done for getting through the ordeal - and to your conductor for sensitivity. It must have been an epic of nerves. I only play for my fellow students and I get the jitters. I can only imagine. My teacher is lovely, too. I think you did a marvellous job and I would probably have gone home right at the beginning. Congratulations on toughing out your nerves and playing through! You are so courageous! And look how much everyone appreciated your being there and your effort. I'm glad you were encouraged by those few kind words. This is a very uplifting story. I am not a musician but there are other areas in life where I might do well to remember this and just show up and do what I can. I'd say what you bumped up against was a band full of empathic musicians. Lucky you. I bet you played beautifully. I'm afraid you rate my playing higher than it actually was, but I did do my best, and am delighted to have survived on my own! don't want to do it again for a loooooong time! Sounds grueling, and I'm so proud of you for putting aside your fear and doing your best. Good for you! Musicians can be intimidating and incredibly charming. I am glad yours are so great!